PA chairman praises Trump for his efforts to achieve a peace deal with Israel. 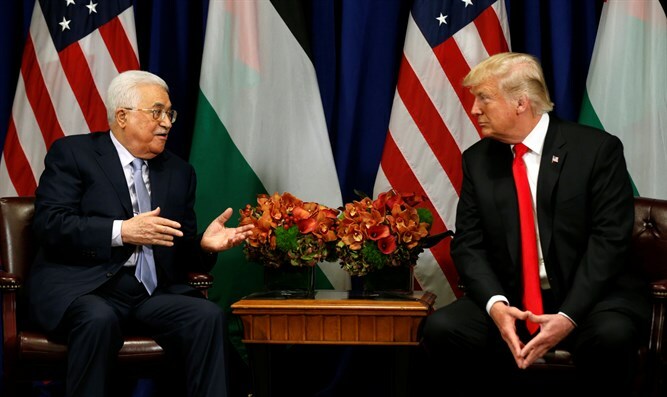 Palestinian Authority (PA) chairman Mahmoud Abbas on Wednesday praised U.S. Donald Trump for his efforts to resume peace talks between Israel and the PA. Speaking at a meeting with Trump on the sidelines of the UN General Assembly, Abbas said the meeting attested to the president’s seriousness about reaching a Middle East peace deal soon. “If this is any proof to anything ... it attests to the seriousness of your excellency, Mr. President, to achieve the deal of the century in the Middle East during this year or in the coming months, God willing,” the PA chairman said, according to comments quoted by Reuters. Trump said during the meeting that he is prepared to pour his heart and soul into brokering a permanent peace agreement between Israel and the PA.
"I certainly will devote everything within my heart and within my soul to get that deal made. From the time I was a little boy, I've been hearing about peace in the Middle East. We're going to see what we can do," Trump told Abbas, reported The Washington Examiner. Trump indicated he remains optimistic about achieving peace in the Middle East, though he cautioned "there will be no promises" made by his administration. "So many people have talked about it and it's never happened," he said. "But we are fighting very hard. We are trying very hard. We are all getting along together very well. We'll see if we can do it and if we do do it, it will be a great, great legacy for everybody." Abbas said his delegation has met with Trump's team "more than 20 times" since the president took office, and added he is "very grateful for these efforts." Trump’s senior advisor and son-in-law, Jared Kushner, has visited the region several times as part of the administration’s efforts to restart stalled peace talks. Most recently, Kushner visited in late August and held meetings with both Abbas as well as Prime Minister Binyamin Netanyahu. While Netanyahu thanked Trump and the delegation led by Kushner for their efforts to pursue peace and stability in the region, PA officials have expressed pessimism that Washington's peace efforts can bear fruit.